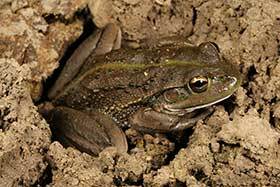 The aim of this project, which got underway in October 2017, is to establish whether or not there are populations of Southern bell frogs and Sloane’s froglet on a large dryland grazing property in the Wah Wah district, an arid zone within the Murrumbidgee Irrigation Area. Southern bell frogs are listed as endangered in NSW, and vulnerable nationally. Sloane’s froglets are listed as vulnerable in NSW and are currently being considered for listing as endangered at a national level. Currently, the district receives its stock and domestic water through open channels. However Murrumbidgee Irrigation, with funding from the Federal Government, is changing that with water to be delivered by pipes. Some of the landholders in the district were concerned that this could impact on the two frog species. Field surveys commenced in late October/early November, after water had been delivered to the sites. While neither of the two species was found in the first survey, after a second survey in December after significant rain, Southern bell frogs were found at two sites. A third survey in January in 2018 found Southern bell frogs at a third site. 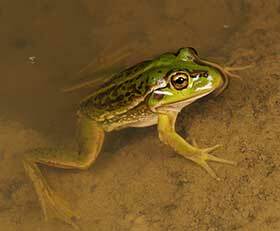 The researchers also found some of the more common frog species, namely the Plains’ froglet, Giant banjo frog and Spotted marsh frogs. A further survey will be undertaken in April as Sloane’s froglet is a winter active frog and difficult to find in summer. However the site is outside the froglets’ known distribution. As well as the surveys, the researchers have placed call recorders at the sites and will analyse that data. An interim report describing the findings has been supplied to Murrumbidgee Irrigation Ltd. This project has established that there populations of Southern bell frogs at the study site. However further investigation is needed to determine how many and how widespread Southern bell frogs are across the landscape.